Like a lot of infectious disease geeks, I hurried to the theatre last night (with a good flu buddy, of course) for my first look at Steven Soderbergh’s pandemic thriller `Contagion’. For those hoping for a typical summer blockbuster – with over-the-top CGI special effects, juvenile plot lines, incessant pyrotechnics, and gratuitous gore – Contagion may fail to impress. But for the rest of us . . . Contagion provides a thought provoking and realistic look the nightmare scenario presented by a severe pandemic. Understated and scientifically plausible, this film is designed to make you `think’ as well as feel. And 12 hours post-exposure (that’s how one feels after watching), the images and themes of this movie continue to haunt. The movie incorporates plot points reminiscent of China’s SARS outbreak of 2002-2003, the Nipah virus outbreak in Malaysia in 1998, and the less well known Melaka Virus family cluster in Malaysia in 2006. Like SARS, the movie’s fictional MEV-1 virus is initially passed on to the public via unsanitary restaurant practices, and like Nipah, the virus enters the food chain when, as the movie states, `the wrong bat met up with the wrong pig’. The Maleka virus – which was initially reported in a 2007 PNAS article called A previously unknown reovirus of bat origin is associated with an acute respiratory disease in humans, infected a 39 year old man when a bat flew into their Malaysian home. More than a week after he was placed in isolation, two other members of his family came down with the same illness, suggesting H-2-H transmission. Bats, probably the most abundant, diverse, and geographically dispersed vertebrates on earth, have recently been shown to be the reservoir hosts of a variety of zoonotic viruses responsible for severe human disease outbreaks, some with very high mortality (9). In the period from 1994 to 1999, four new viruses in the family Paramyxoviridae were discovered, and all appeared to have bats as a reservoir host. You can read more about this case in First Bird Flu, Now Bat Flu. They really didn’t have to design a new virus, the bats are already doing that. 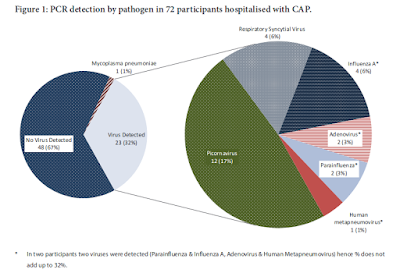 In all likelihood the next pandemic will be sparked by a far less-lethal (but still potentially devastating) influenza virus, but the truth is a high CFR (case fatality ratio) novel pathogen can’t be discounted. Soderbergh’s Contagion manages to avoid most of the clichés of the genre. Instead of focusing on gratuitous death and destruction, the more horrific events are seen as part of the passing parade, while scientists and doctors race to find a vaccine. While I come away greatly impressed with this movie, and the respect it gives the science of virology and epidemiology, I do have a few - mostly minor – quibbles. The number of people infected four months into the pandemic seemed low given the R0 number (basic reproductive number) of the mutated MEV-1 virus was stated to be 6. And the societal disruptions seemed oddly mixed – with grocery stores looted and empty – but with apparently gas for cars and people still going to the airport. Having the CDC send a single EIS officer (Kate Winslet) to conduct a major epidemiological investigation stretches credulity, but adds to the dramatic plot line. The biggest quibble for me, however, was the speed with which a vaccine is developed, manufactured, and starts to be delivered. We’d need to get very lucky indeed, to have a vaccine for a novel non-influenza pathogen in fewer than 6 months. I’ll pass on taking umbrage over the depiction of Internet bloggers as conspiracy nut jobs, only because that dangerous and vocal contingent does exist. It would have been nice if they could have showed the positive side of Flublogia, but I accept it was only an 106 minute movie. Quite commendably, all of the performances were restrained and believable. No one was tempted to `chew the scenery’, even during the most intense moments of the film. Laurance Fishburne was solid and authoritative as always – yet humanly flawed, Matt Damon handled a difficult scene where he is told of his wife’s death with great aplomb, and Jennfier Ehle literally shone as courageous Dr. Ally Hextall, who risks taking an unproven vaccine she is working on and then exposes herself to the virus. Despite the high powered Hollywood ensemble cast, the real `star’ of this movie was never seen. Soderbergh wisely focused his lens on the mundane surfaces we touch mindlessly hundreds of times every day – door knobs, credit cards, menus, telephones . . . and our faces – and resists the urge to show us CGI representations of swarming virus particles. The fact that we never see the virus only builds the paranoia. Suddenly, nothing is benign. Nothing is safe. Everything you touch could be contaminated. While those expecting a post-apocalyptic zombie-virus movie may be disappointed, Contagion proves that it is possible to create an intelligent and effective thriller based on solid science and where the government isn’t always the bad guy. The bottom line: Go see it. If Contagion wins at the box office this summer, perhaps the idea of intelligent movie making will go on to infect other studios. Ah, shucks. Lisa. You are too kind.